3-6-2015 The Worlds Largest Flower. Bolivia Fact of the Week. Hello and welcome back. Today's Fact of the Week is about a flower, but not just any flower, the largest flower on Earth. So here is the Puya Raimondii. 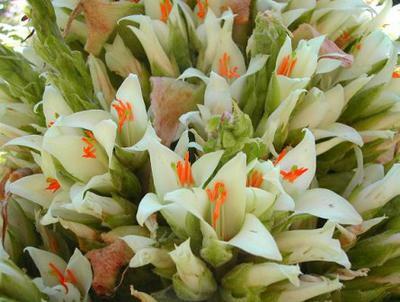 The Puya Raimondii, also known as the Queen of the Andes, grows in Bolivia and Peru. The flower has a massive inflorescence that can reach up to 10 m in height and bearing over 3 thousand flowers and 6 million seeds in each plant. It's growth cycle is about 40 years. It's considered to be an endangered species because like most bromeliads it dies quickly after it blooms. It is named after the 19th-century scientist from Italy Antonio Raimondi. The scientist found it in Chavin de Huantar and published it in his book El Peru naming it Pourretia gigantea. However, in 1928, it was renamed by German botanist Hermann Harms who changed the name to Puya Raimondii. 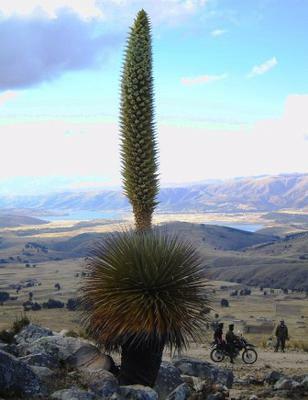 It can only grow in the high Andes at an elevation of 3200 – 4800 m. The flower blooms in the wild only every 80 to 100 years. Because of this, to see it is a once in a lifetime experience you don't want to pass up. So that was the world's largest flower living in Bolivia. Image Source. We have some cool stuff don't we? Speaking of which, here's a question. Bolivia has the world's largest flower, right? What is the largest thing that lives in your country? Answer in the comments below. Bye. Join in and write your own page! It's easy to do. How? Simply click here to return to Bolivia for Kids Blog.